At last, we can see spring on the horizon and although today's temps are a bit on the lower side, I can't help but want to highlight an eye-catching and colorful printed shoe. 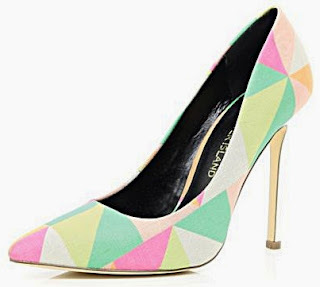 The pastel-hued, River Island Coral Print Court Shoe features a geometric pattern all-over its classic silhouette, a low vamp, pointed toe and a 4 1/2" heel with a gold-tone finish. This Court shoe is a great way to add a pop of refreshing color to your look. Get it on asos.com for under $100.00.